This is obviously going to be a long fight. However we can see the shape of the approach here. It starts locally with banning certain chemical and genetic protocols at the local level. This needs to be followed up with the banning of non-organic practices. This is a tough one of course, but we need to focus our farmers on the organic protocol and to promote the establishment of the needed protocols that makes it all fly. Do this and momentum will be established at the county level which is the best practical option. A county on the Great Plains with square mile farms will not be affected while counties with dense intensive agriculture will clearly prosper under this regime as it naturally enforces cooperation. The truth is that we need to get there fast. Our population requires healthy food and is in fact demanding it. We are learning to enjoy raw fermented vegetables because it happens to be one of the best ways to eat raw vegetables just as we learned to love yogurt, formerly known as sour milk. There is little point is getting there if we do not have a flood of excellent food available. Today we have a food culture dominated by an impoverished industrial production system shipping impoverished goods, operated by impoverished workers and mostly eaten by the equally impoverished. It need not be and must not be. Despite an onslaught of spending by agribusiness giants such as DuPont and Monsanto, voters in Jackson County and Josephine County overwhelming took a stand for measures protecting "seed sovereignty and local control" of food systems. The Jackson Measure 15-119 passed 66-34 percent, while the Josephine County Measure 17-58 passed 58-42 percent. "It's a great day for the people of Oregon who care about sustainability and healthy ecosystems!" GMO Free Oregon wrote on their Facebook page after receiving the final tally. 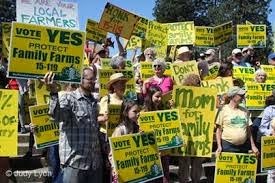 “Tonight family farmers stood up for our basic right to farm,” cheered Elise Higley, Jackson County farmer and campaign director for the Our Family Farms Coalition, in a statement following the vote. Calling the bans a "tremendous victory" for the citizens and farmers of the counties, as well as for the national anti-GMO movement, Ronnie Cummins, national director of the Organic Consumers Association (OCA), said the votes are further proof that, when given a voice, citizens will choose a sustainable food system over corporate-dominated agribusiness. "These victories make it clear to agribusiness giants like Monsanto and Dow that the day has come when they can no longer buy and lie their way to victory," Cummins said. "By using the tools of democracy, such as ballot initiatives, citizens can overcome corporate and government corruption through honest campaigns, built on a foundation of truth, science and fair play." In Jackson County, proponents of the ban raised only $375,000 compared with the nearly $1 million raised by the opposition, whose donors included Monsanto, Syngenta and DuPont Pioneer. Spending in Josephine County was lower on both sides. According to OCA, the Josephine ban will likely be tested in court after that state's passage of the controversial lawS.B. 863 in October 2013, stripping counties of the right to pass GMO bans. The Jackson County measure is exempt because it had qualified for the ballot prior to the passage of the law. The Oregon counties now join a growing list of communities who have enacted similar bans including Santa Cruz County, Trinity County, Marin County and Mendocino County in California, and San Juan County in Washington state, as well as numerous cities nationwide. Hawaii’s Big Island and Oahu have banned GE taro and coffee. Earlier this month, Vermont passed a landmark law which mandates that all GE foods sold in the state must be labeled. Unlike Conneticut and Maine, which passed measures that require a certain number of other states to also enact GMO legislation, Vermont's law has no such "trigger clause."